"People from all over the could try arrive for a weekend full of fun and frolics were they meet up with old friends and make new friends. We have a full weekend of Live entertainment, 10 Live Bands, Burlesque Shows, DJ that plays non stop. there are a lot of trade stalls for you all to treat yourselves and you can even get a new tattoo from our tattooist... Saturday brings in the Halloween themed fancy dress night and its truly an amazing sight to see. Everyone is welcome to come and enjoy their weekend with us!" said Charlie from The Original Cruisers. 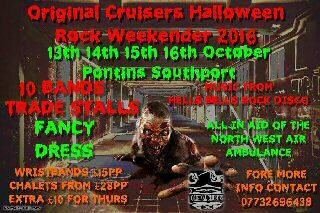 Wristband prices start at �15 of you ore book or �20 if you pay on the gate, its the cheapest rock weekend to be held in Southport... If you wish to get some wristbands please contact Charlie on:- 07732696438.